In keeping with our emphasis on the presence of Jesus Christ at the center of our worship, Holy Communion is celebrated at all Sunday services. St. John’s has an open communion policy. Any baptized Christian is welcome at the Lord's table. If you have any questions about the meaning of or participation in Holy Communion, speak with a Pastor at 908-273-3846. 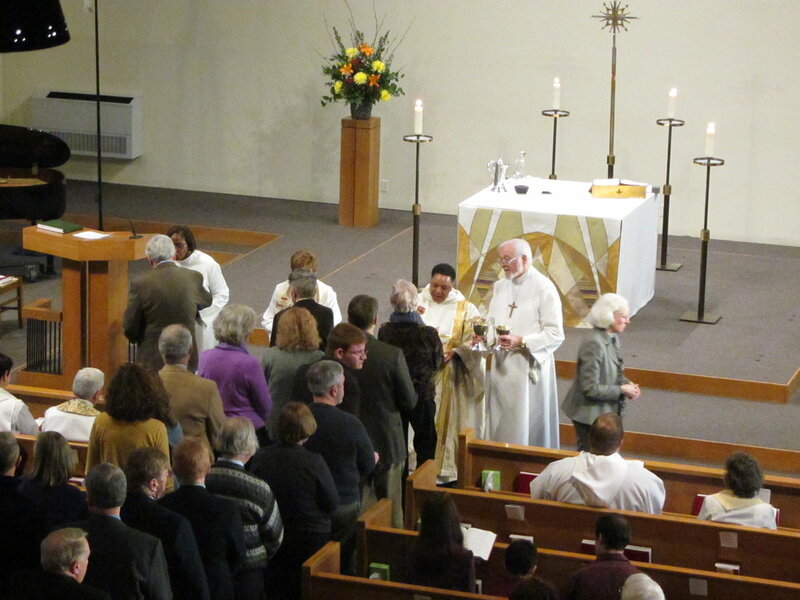 Our early service offers a traditional liturgy with hymns, normally lasting 45 minutes. We have a varied schedule of Forums, guest speakers, Confirmation Class, Children’s Faith Formation are offered throughout the year. See calendar for current schedule. Our second service is traditional liturgy with wonderful variety that is multicultural and inclusive. This service regularly includes a children’s message, choirs and instruments, lasting 60 to 75 minutes. We gather for food and fellowship, Word and sacrament around a shared dinner table. Childcare is available from 8:00 AM-12:00 PM every Sunday. Candlelight Communion with professional brass quintet, choirs & "All-In Pageant." This service is especially appropriate for families with young children. Candlelight Communion with professional brass quintet, choirs & sermon. This service celebrates the incarnation with festive flourish. An intimate, quieter service to celebrate the ChristMass. We begin the season of Lent with the imposition of ashes with Holy Communion. We offer brief 30 minute services of Holy Communion in Lent. Simple Soup Suppers with discussion precede worship at 6:00 PM. We conclude our Lenten season of confession with individual absolution. We then gather with Jesus for the last supper, including the ancient rite of foot washing and stripping of the altar. For 30+ years we have joined with neighboring churches to remember Jesus’ trial and death in a child-appropriate format. Adults and children of any age are welcome. We hear the story of Jesus’ passion and death, pray for the needs of the whole world. and end the service with a procession of a rough-hewn cross. This is the night! We celebrate Jesus’ resurrection with a new fire, the passing of the light, sharing wonderful Bible stories, joyous renewal of baptism, and finally celebrating the first Eucharist of Easter. We celebrate the Resurrection of Our Lord with all the fanfare the church can muster, with festival services including a professional brass quintet and choirs. An Easter Brunch and Easter Egg Hunt are held at 9:00 AM.